How Far is Tulsi Aangan? Kitchen Black Granite platform with stainless steel sink and service platform. 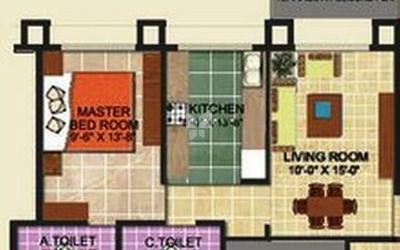 Designer ceramic titles dado above platform upto 2 feet Bathroom Designer ceramic tiles in flooring. Designer dado tiles on wall upto door height. Concealed plumbing with standard quality make fitting and fixture. Flooring Vitrified flooring in Livingroom, Bedroom and kitchen with Skirting. Door Decorative main door. Windows Powder coated French aluminium window with marble sill. Mosquito Net in Windows.